ABF is excited to announce that two Howie Wier Memorial Conservation Grants have been awarded this year, rather than just one. Both proposals received $1,500. The committee was thrilled to see two projects focusing on Sahara Mustard and really loved the idea of seeing them both progress simultaneously. We recognize the value in studying mustard both on a local and regional level and are happy to fund studies that will look at it more closely. 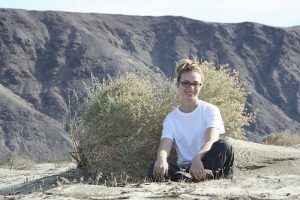 The two awardees are: Sarah O’Neill, from UC Riverside, whose project is The Impact of Sahara Mustard on Anza-Borrego’s Arthropod and Plant Communities. Project Summary: Assess arthropod & plant (aboveground & soil seed bank) community composition in plots invaded by B. tournefortii, and in mustard removal plots. Quantify the impacts of B. tournefortii invasion, and determine the effectiveness of weeding efforts in restoring native assemblages. Daniel Winkler, from UC Irvine, whose project is Origins and impacts of a highly invasive plant species in the California deserts. 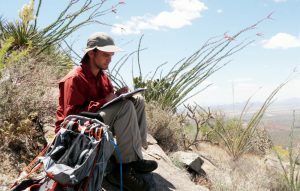 Project Summary: The proposed project will use genetic, physiological, and ecological techniques to understand the spread of the highly invasive species, Sahara mustard (Brassica tournefortii) in the Colorado Desert and beyond. Specifically, I will determine the point(s) of introduction using molecular genetics, and predict the species' spread with physiology and ecological modeling. Congratulations Daniel and Sarah!